A quick-dry top coat helps prevent smudges. Your home-painted nails can look professionally done if you use the right techniques. Start with clean nails; apply thin coats of nail polish and finish off with a clear topcoat. Practice makes perfect -- you can have beautiful nails that look as if they were done at the salon every time. Clean your nails before applying your nail polish, and your home manicure will look better and last longer. Remove old nail polish using nail polish remover. Wash your hands with warm soap and water, paying special attention to your nails. Clean underneath your nails with a nail stick. Let your nails air dry, or dry them under a hair dryer before applying your nail polish. Nail polish does not stick properly on wet nails. Apply nail polish in two thin coats, instead of one thick coat. A thick coat of nail polish will peel off. Swipe both sides of the brush against the inside opening of the nail polish bottle to remove excess polish, which will leave you with the correct amount of nail polish on the brush. Smooth the brush over your nail, using long slow strokes, starting from your cuticle and ending at the tip of your nail. Paint each nail, using three brushstrokes. Make the first brushstroke in the center, followed by a brushstroke on the left side and then the right side. Overlap each brushstroke to spread the nail polish evenly across your nail. Allow the nail polish to completely dry before applying a second coat. Remove any nail polish that gets on your skin. After you are done painting your nails, dip a cotton swab in nail polish remover. 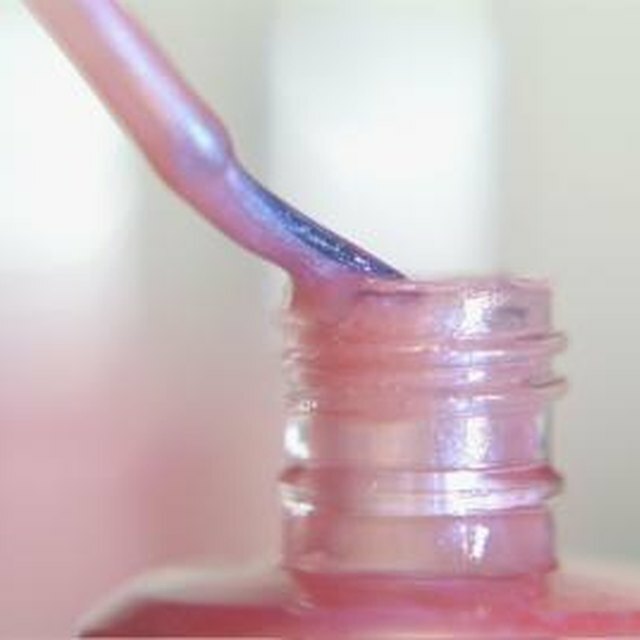 Press the cotton swab against the inside opening of the nail polish remover bottle to remove excess so it does not drip. Gently rub the cotton swab over the areas of your skin that are coated with nail polish. Apply a layer of clear nail polish over your colored nail polish to protect the colored polish from chipping. Make sure your colored nail polish is fully dry before applying the clear nail polish. For best results, use a clear nail polish that is labeled as a top coat. Topcoat nail polishes are stronger and more resistant to chipping than regular nail polishes. Apply the top coat using the same techniques used to apply your colored nail polish. Paint one layer of top coat on the under side of your nails to strengthen them against breakage.